In 2009 the Staatsbibilothek zu Berlin succeeded in obtaining an important autograph of Felix Mendelssohn Bartholdy from a private owner. 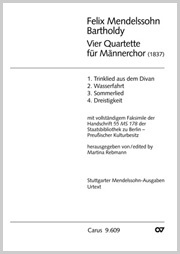 In the spring of 1837 he composed his four Quartets for Men's choir a cappella, whose texts were written by Goethe and Heine. 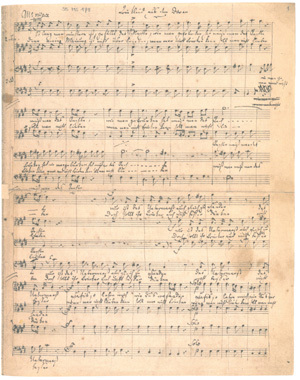 In the autograph the lied "Dreistigkeit" is in a version unknown until now. It is published here for the first time. The present edition, published in cooperation with the Staatsbibliothek, presents all four of the pieces in high quality color facsimiles, as well as in a modern engraved edition.